PRISTINA – A requiem service for the victims of violence committed by ethnic Albanians in Kosovo on March 17-18, 2004 was held at the Church of St. Nicholas in Pristina on Tuesday. 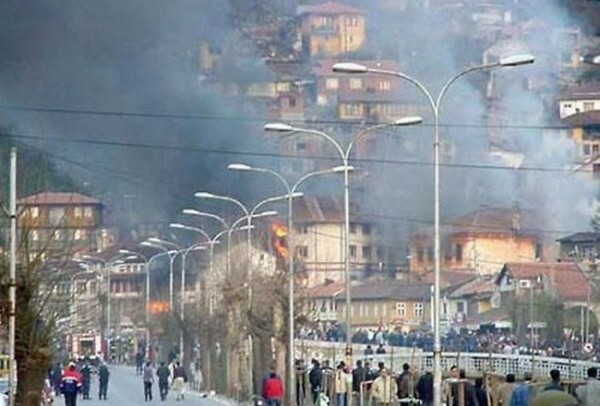 In a brief homily following the service that was attended by a dozen of believers, Parish Priest of Pristina Darko Marinkovic said to those gathered that the church in Pristina was among the 35 Orthodox churches and monasteries that had been destroyed and burned during the March 2004 pogrom. Although it was rebuilt, traces of violence on the church building and in the cemetery in the church yard are still visible, he said. The service was attended by Deputy Prime Minister of Kosovo Branimir Stojanovic and Belgrade’s liaison officer in Pristina Dejan Pavicevic. Speaking on a Radio Kosova program in the Serbian language, they sought accountability for the pogrom in which ethnic Albanians killed eight, wounded 170 and persecuted 4,000 Serbs. Stojanovic stressed that the Serbs in Kosovo-Metohija had to be given institutional protection to prevent such violence against them from hapening again. Only a few dozen Serbs have remained in Pristina, as more than 40,000 have been forced to leave their homes following the 1999 NATO bombimg campaign against Serbia and the setting up of the UN Interim Administration in the southern Serbian province in June the same year.